How does this sound? A series of terrifying visions are the key to unlocking a horrifying secret of a remote Minnesota town, a dreadful truth long since forgotten by the locals. But when the spirits of the dead are accidentally disturbed, an ancient curse returns to wreak its revenge. OK, it seems unlikely that the film is as lame as that non-specific and hackneyed plot summary makes it sound. American Evil is the latest import from Metrodome that has undergone an inexplicable title change for its UK DVD release. 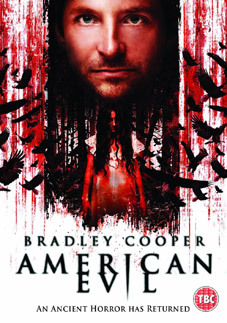 Originally (and more intriguingly) titled Older Than America, it was released in 2008, directed by the brilliantly named actress Georgina Lightning (she's also in it), and features among its cast Adam Beach (Cowboys and Aliens), Tantoo Cardinal (Fathers&Sons) and Bradley Cooper, he of The Hangover and Valentine's Day. Intriguingly, the few reviews I've managed to track down have been very positive, so hopes are cautiously high. American Evil will be released on UK DVD and Blu-ray by Metrodome on 5th March 2012 at the RRP of £15.99 for the DVD and £19.99 for the high-def fellah.